SP Technology has leveraged the impressive capabilities of the Beckhoff XTS Continuous Linear Servo System to create a machine that combines speed, accuracy, flexibility and a reduced footprint. Contributed by | Beckhoff Automation Ltd.
SP Technology, formed in 1984, is dedicated to providing solutions to many of today's production problems and demands with the design and manufacture of bespoke automation systems. The company’s success is based upon a dedicated and dynamic group of engineers and support staff who are capable of providing the most appropriate solutions to meet customers' automation needs in a cost-effective and timely manner. SP Technology designs and develops innovative systems to the highest degree of performance and reliability, offering the complete package of skills in automation engineering, incorporating cutting-edge technologies to determine the appropriate solution. Each system it produces is unique and requires researching solutions to problems that are not provided using “off-the-shelf” equipment. Over the years, the company has produced over 800 systems for customers across the world, in industries including pharmaceutical, medical devices, munitions, food and beverage and automotive. These systems have ranged from bench-top solutions to multimillion pound assembly lines. 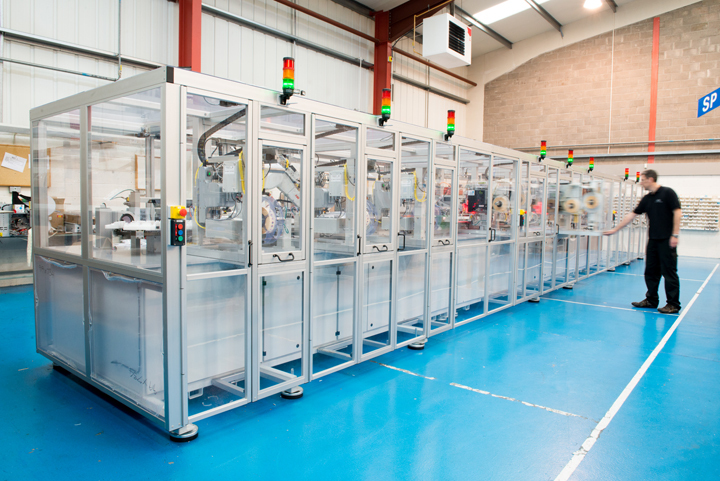 In a recent project for a UK healthcare customer, SP Technology was tasked with developing a fully automated labelling machine, which had to apply labels with a very high degree of accuracy and then package them into storage trays at a rate of up to 100 parts per minute. For this machine the engineers at SP Technology knew that conventional servo solutions would not be able to offer the accuracy required and, as a result, it turned to Beckhoff Automation Ltd. for an advanced automation and motion solution that would meet the demanding needs of the end customer. The main challenge of this application was to overcome the inaccuracies associated with standard industry approaches, and create a solution that would allow labels to be repeatedly applied and wrapped around 370° on a cylindrical device. Typical accuracies achieved by standard solutions is within 0.5 mm and 5 degrees from reference features on the label, however in this application the accuracies required were within 0.1 mm and with no visible overlap. The Beckhoff solution incorporated in the machine comprised multiple elements, but core to the machine’s impressive accuracy and performance were three XTS Continuous Linear Servo Systems totalling almost 30m in combined length. In addition to the XTS modules were a selection of 48V Beckhoff servo motors and a Beckhoff industrial PC, controlling the automation and motion solution over a TwinCAT Ethernet-based control network. A TwinSAFE network and ancillaries was also used for machine safety. In addition to the Beckhoff products a number of third party devices were deployed, including vision and code readers, pneumatics for the pick and place operations and a six-axis robot. In operation, trays populated with parts were manually loaded into the machine and separated to present a single tray for the unloading of devices. A servo operated pick and place solution then loaded an array of devices on to purpose-built nests, which were bolted to the individual XTS Movers. The nests had to be designed with spring-loaded retention fingers in order to keep the product stable during the rapid accelerations and decelerations with speeds of up to 2 m/s from station to station. As the nest carried an odd number of parts, and the tray had an even number in each row, intricate programming of the TwinCAT software was required in order to sequence the movers into the correct positions so that all the parts were processed as required. Prior to a nest reaching a labelling station, the labels were peeled off and presented to a vacuum pad where they would be inspected by a vision system. The vision system would feedback the angular and linear displacement from datum edges and write these parameters to the Beckhoff IndustrialPC controlling the system. Once the parameters were gathered a rotary servo motor connected to the vacuum pad would turn to compensate for the angle offset and the final mover position was adjusted to cater for linear displacement. Once the label was rotated and the mover positioned correctly, the vacuum pad would engage with the product, leaving the label behind. Once applied, the label would be left with the ‘legs’ trailing down either side of the device and would require wrapping then overwrapping to create the overlapped joint. This was achieved using a roller connected to an elliptical cam that would engage and disengage the roller at points along a rotary move. A 48 V servo motor was used to drive this cam and through a reducing gearbox provided the torque and control to wrap the label in two directions in the short cycle time. Due to the product requirement for labels on opposite faces, three XTS systems were used with a re-orientate mechanism in between each system. Each of these pick/re-orientate/place modules was driven by a geared 48 V servo motor that gave sufficient acceleration and speed to transfer the parts in the required cycle time. Once the third and final label was applied, the devices were loaded back in to the same batch of trays that they were originally unloaded from. The machine also automatically rejected parts and a buffer system was used to cater for the shortfall due to rejects. For quality purposes, label batch and product data, including inspections, were recorded as the machine processed the devices through the system. 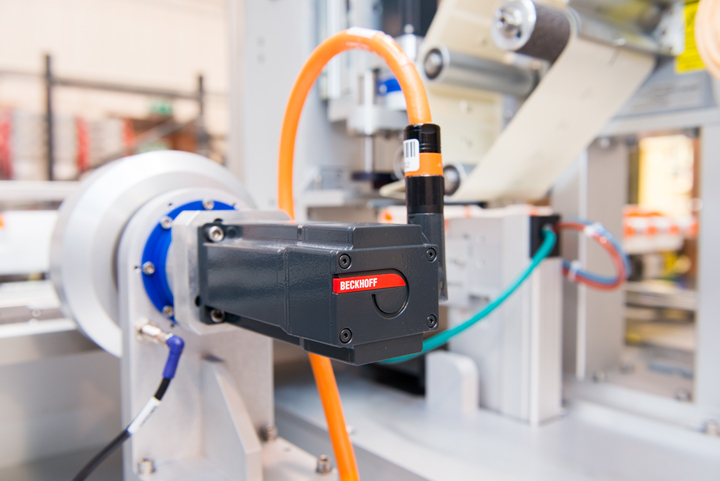 According to Stephen Hayes, UK Managing Director at Beckhoff Automation Ltd.: “The Beckhoff XTS system unites the benefits of rotary and linear systems. As a result, the most diverse applications can be realised with just a few coordinated components. And thanks to the low construction volume, the energy efficiency and the size of a machine can be significantly reduced.” This project was a successful team effort between SP Technology and Beckhoff, reinforcing Beckhoff’s policy of working closely with key partners.